Went out last Monday to part of the Ouse Washes - flooded at the moment. Great variety of water birds, but the most interesting thing was watching a Great Crested Grebe trying to swallow a rather large fish. After every attempt it swam around for a while, either thinking hard, or summoning up strength for a further bout of swallowing. 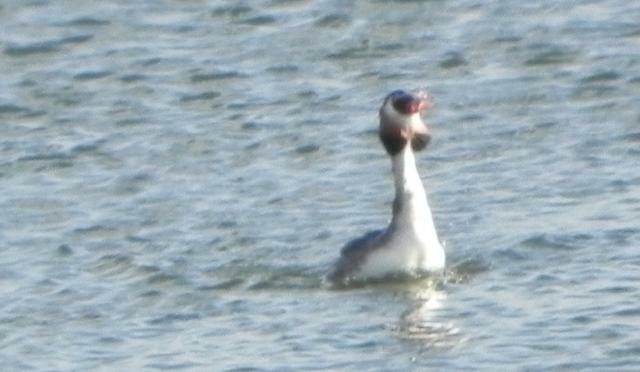 It was rather worrying at times, but eventually it managed to get it down and swam off for another bout of fishing! Must have been at least five minutes while we were watching. It's horrible when you get food stuck in your throat. Poor bird. That was a bit ambitious. Not sure that counts as getting 'stuck in the throat', more stuck getting to throat. I am always amazed at how long they can stay under water. You think they will never come up again and then they finally bob up quite a way from where they went down. Today's walk was very enjoyable - it began rather misty and then he sun burnt through and it got rather warm. Heard Willow Warbler, Blackcap, Chiff Chaff and Cetti's Warbler amongst the songsters, and watched Red Kites, Buzzards and pair of courting Cranes, which was the highlight of the walk. Also watched a nest of Honey Bees busy carrying pollen into their nest in a hole in a tree. Remarkable variation in the colour of the pollen loads - mainly yellow but some distinctly red, which we guessed to have come from the nearby Aspen catkins. Also saw some Mining Bees whose identity is yet to be confirmed. 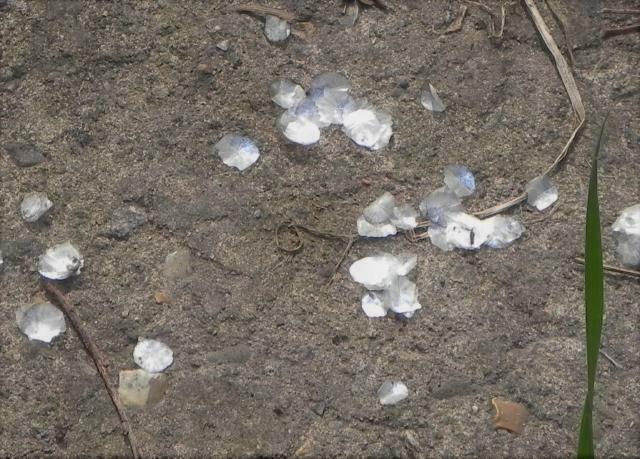 Little to photograph, except these fish scales, found on a block near the edge of a dyke. Might be from a Pike, and perhaps the work of an Otter? When I got home I heard Blackcap and Chiff Chaff in the garden! it could be lighting and landscape but scraped of scales is an otter trick. use your nose and seek the territory markers is a very good confirmatory tactic. my otter spot involves a bit of a scramble but they are pretty cool about ignoring the silly man and his dogs and him cooking and fishing and stuff. shy no, they are happy to share a space with polite folk. my yellow hound was a bit surprised at swimming cats catching fish but before long they and he realised that sunbathing on the rocks was a common interest . ps otters like fried bacon. ps " my" ones live at the seaside quite a long way north and west of here. be where you think you can see where they might be ( a bit of tracking will find marking and eating spots ) and they can see you ( dont hide ), do something harmless and fairly quiet , moving about is ok , foraging or fishing and cooking is fine etc etc while you wait , say hello when they turn up and when they come back to see if you really are still there say hello again . inland ones might have different behaviour to their scottish rellies but chances are they are just as nice if you get to know them even if they do smell of fish . Heavy footed Otter to leave a print in a slab of concrete! But I do see what you mean! pps other things scrape scales as well. tracking is ones friend to answer the otter or not question. Also had excellent views of Red Kites, some of which were carrying twigs and bits of grass - presumably for nest building purposes. just a thought but cabbage is a bit of a stretch from the look of the things. i'm game to believe it smells of vinegar. 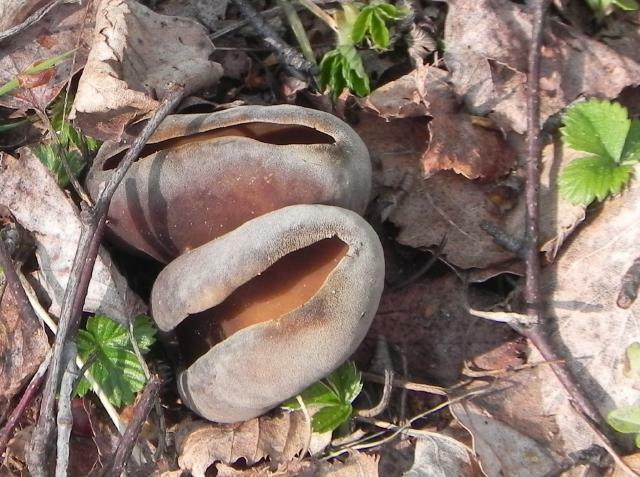 fungi seem to manage everything from corpse to apricots as their signature perfume. coming across decent scientific descriptions that include " smells of fountain pen ink " or " smells like warm bread " is rather charming.